Is your web site currently classified by Google as Not Secure. Click to find out the easy way to upgrade. You see, Google made an update in October that penalizes sites that don’t have something called a “SSL Certificate.” What’s that? In laymen’s terms, a SSL certificate is what makes a website secure. Yes, the dreaded “Unsafe Website” Warning. NOBODY wants that, trust me. Google are pushing hard to get all legitimate websites to a secure level and by so doing reduce spam and identity theft. There was a big update in the Google’s Algorithm due to which Google is penalizing those websites which don’t have SSL certificate. Basically, SSL makes the website secure. Google will prioritize sites that are secure - and penalize those that aren’t. Around the world, data espionage is a serious problem for both international authorities and consumers. Internet security is occupying an increasingly central role for both businesses and individuals. Without a doubt, the Information Age has substantially affected the way we interact with one another on both a private and professional basis. In-house communication, customer data, and other sensitive information build up some of the most vital nuts and bolts of this infrastructure, and protocols like SSL and HTTPS are vital for ensuring their secure management. By upgrading to SSL you immediately enhance the security of your web site. Boost conversions and rankings in one simple step. 84% of online shoppers say they abandon a purchase when they realise the website is insecure. SSL certificates can be installed by us with the minimum of fuss. It can be applied to any legitimate website no matter where your domain is set up. So what are you waiting for? Secure your site today. What is SSL, the technical bit. The term SSL (short for ‘secure socket layer’) describes a technique for encrypting and authenticating data traffic on the internet. With regard to websites, the transfer between the browser and web server is secured. Especially when it comes to e-commerce, where confidential and sensitive information is routinely transferred between different parties, using a SSL certificate or a TLS (‘transport layer security’) is simply unavoidable. To be able to create a SSL connection a web server requires a SSL Certificate. When you choose to activate SSL on your web server you will be prompted to complete a number of questions about the identity of your website and your company. Your web server then creates two cryptographic keys - a Private Key and a Public Key. The Public Key does not need to be secret and is placed into a Certificate Signing Request (CSR) - a data file also containing your details. You should then submit the CSR. During the SSL Certificate application process, the Certification Authority will validate your details and issue a SSL Certificate containing your details and allowing you to use SSL. Your web server will match your issued SSL Certificate to your Private Key. Your web server will then be able to establish an encrypted link between the website and your customer's web browser. The complexities of the SSL protocol remain invisible to your customers. Instead their browsers provide them with a key indicator to let them know they are currently protected by a SSL encrypted session - the lock icon in the lower right-hand corner, clicking on the lock icon displays your SSL Certificate and the details about it. All SSL Certificates are issued to either companies or legally accountable individuals. Typically an SSL Certificate will contain your domain name, your company name, your address, your city, your county and your country. It will also contain the expiration date of the Certificate and details of the Certification Authority responsible for the issuance of the Certificate. 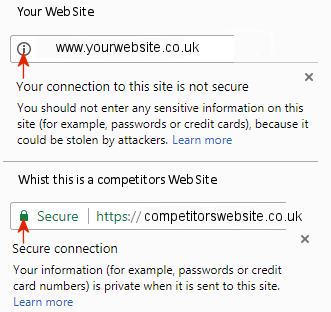 When a browser connects to a secure site it will retrieve the site's SSL Certificate and check that it has not expired, it has been issued by a Certification Authority the browser trusts, and that it is being used by the website for which it has been issued. If it fails on any one of these checks the browser will display a warning to the end user letting them know that the site is not secured by SSL. Using SSL helps keep communication safe from those looking to snoop into or manipulate personal data.